There are currently over 2,000 Jiffy Lube quick lube stations across the United States. To find your local Jiffy Lube, click here. Jiffy Lube is a franchised company, who’s parent company is the Shell Oil Company. Even though the company is owned by Shell, individual franchise owned shops are responsible for issuing their own oil change coupons. 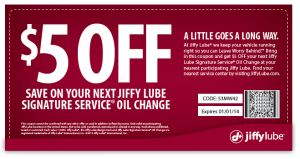 There are usually coupons for an oil change available from Jiffy Lube for all locations, but you might have a better discount if you look up your local shop for a Jiffy Lube Signature Service Oil Change.